During arraignments Monday morning in Crawford County Common Pleas Court, the highest bonds continued from Municipal Court were levied against two defendants with drug-related charges. Dustin L. Nolen, 29, Bucyrus, and Cordale D. Davis, 27, Cleveland, each entered not guilty pleas to their charges. Nolen is charged with two counts of trafficking in drugs and one count of possession of drugs while Davis is facing two counts of trafficking in drugs. It is alleged that a child was present at the residence during drug activity. The pair was arrested, along with James E. Shope Jr., 26, on March 10 after law enforcement searched Shope’s residence at 1301 Monnett St. Cocaine, heroin, syringes and cash were seized in the drug raid. Judge Sean Leuthold continued the $500,000 bonds set for Nolen and Davis while bond for Shope was set at $100,000. He is charged with possession of drugs, a fifth-degree felony, and misdemeanor possession of drug abuse instruments. While Shope is only looking at up to one year in prison if convicted, Nolen is facing up to five years and Davis is facing up to four and a half years. 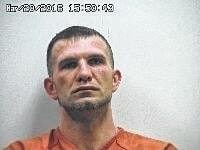 Bond for Shane L. Cameron, 31, Bucyrus, was set at $200,000. He is charged with the illegal conveyance of drugs onto a correctional facility, a third-degree felony, and possession of drugs, a fifth-degree felony. * Jeffrey Nichols Jr., 20, New Washington, disrupting public service, bond set at $25,000. * Jason R. Henney, 46, Galion, having weapons under disability, a third-degree felony, bond set at $250,000. * Kimberly D. Fox, 30, Bucyrus, possession of drugs, a fifth-degree felony, illegal conveyance of drugs into a correctional facility, a third-degree felony, misdemeanor possession of drug abuse instruments, and misdemeanor possession of drug paraphernalia, bond set at $150,000. * Ashlee Treisch, 30, Galion, illegal conveyance of drugs into a correctional facility (Suboxone), a third-degree felony, bond set at $150,000). * Tina L. Rotermund, 45, Galion, possession of drugs, a fifth-degree felony, bond set at $50,000. * Tiffany Moore-Lowe, domestic violence, a third-degree felony, $25,000. * Tony Chatman, 38, Bucyrus, failure to support minor children, personal recognizance bond. * Matthew Burchett, (incarcerated on another conviction), possession of drugs, a fifth-degree felony, personal recognizance.